Hi... I’m Jimmy, and my mission is to improve your life by making it a bit happier - or, better yet, a lot happier - everyday. I am a doctor, “rejuvenating” corporate executive, entrepreneur, author, and speaker. My wife (Jill), our four-year-old daughter (Joie), our 14 month old second daughter (Jae), and our golden retriever (Sunny) live in Tampa Florida and Newport Beach California (we alternate locations every month – so we travel a lot). Through this newsletter, my website, my books, E-Coaching, and other BeHappy! products, I am committed to improving the lives of as many people as possible. So, I would love to hear from you on how your life has changed by using the BeHappy! system, or how I can help improve your life more by making the system even better. Just click here to see a 1-1/2 minute video introduction to the group. Then, go to facebook and search "The Happiness Group" to join. Please go to BeHappy101.com (or see the yellow box at the end of the newsletter) to provide your comments, suggestions, stories, or thoughts and I’ll respond to you personally – as appropriate - as soon as possible. Are You As Happy As You Can Be? The purpose of this newsletter is to provide a regular and consistent supplement to the action-oriented process found in my website - www.behappy101.com - and in my first book, simply called BeHappy! This is far beyond a “How To” concept. It is rather a “Do” system, which, when used in conjunction with the BeHappy! book, helps create your own personal “Happiness Plan” for your life. If you want a template or “blueprint” for this Happiness Plan, Click here and you can get it free. Since my goal is to help make people happier, however, it is best to get the book to use along with the website to achieve maximum benefit from the plan (yes, that’s partly a sales pitch — but it’s true). MY GUARANTEE TO YOU: While most of the information at behappy101.com is free, I want you to BeHappy! with anything you purchase on this site; our reputation depends on it. Nothing is more important to me personally than for you to be completely satisfied with the information you receive. So if you are not satisfied with anything you buy on this site, for any reason whatsoever, simply contact me and I will have a refund check cut and sent to you immediately. Have you set goals for the New Year and beyond? Do you really want to accomplish all your goals? One common reason that we don't achieve the goals we set for ourselves is because we tend to get distracted and lose track of important things that need to be done consistently, in order to make real progress toward goals. The key to really achieving your goals in life lies in constantly reviewing your goals and measuring your progress, in other words, keeping your goals on track. 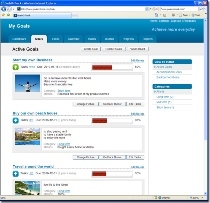 Introducing Goals-On-Track, an easy to use, web 2.0 style goal setting, goal tracking, task and time management software that helps you accomplish any goals in life. Click here to get this GUARANTEED system for setting and achieving your goals. In the USA clinical depression is 3-10 times more common today than two generations ago. Richer workers tend to be happier than poorer colleagues, but research suggests that happy people tend to have greater potential to become rich, so it's a chicken or egg scenario. Women tend to experience their all-time lowest life satisfaction at age 37, whereas men typically experience this at 42. The last edition of this newsletter in December was just before the holiday season, providing tips and strategies for having the happiest, least stressful holiday season possible. I hope you followed some of these tips – or some of your own – and had a wonderful season and year-end (click here to go back and read the previous edition of the newsletter). Well, now 2011 is in full swing and before we know it, the holiday season will be back upon us. What will the end of 2011 be like for you? Think about the answer to that question for a minute and we’ll get back to it as part of the main topic of this edition of The BeHappy! Newsletter. And really, that question relates both to the topic for this edition, and also to the review of the last edition. Because part of the last edition involved setting things up for the best New Year (2011) possible. Have you made your 2011 goals? (Some people call them “resolutions” – although I believe goals and resolutions are not the same, but that’s a different subject for a different article or newsletter). Just as important, have you taken action and made progress toward each of your goals for this year? Whether you have or haven’t (but especially if you haven’t) you should check out this great software for setting and achieving your goals. Also, please click here to read a series at BeHappy101.com on goal setting. So, really, for the follow up to the last edition of the newsletter, the main message is to take some action – right now – toward making 2011 a fantastic, happy year. Part of that means achieving your goals for the year (assuming your goals are aligned with what will make you happy in your life). Taking action means doing something that takes you closer to your goals. It might be just checking out the goal-setting software mentioned above (just click on the link in the box to explore it). Or, maybe you need to do something to improve your relationship (Click here if you need some help in this area). Perhaps you need to join a health club or start a healthy, weight-reducing eating plan (click here to take some action on this topic). Are you stressed out? Take action by clicking here to manage stress and get a free stress-management ebook. Perhaps money relates to a goal for 2011. Take action to improve your income and/or net worth by ... clicking here to start your own internet business ... or click here to explore a strategy for investing your money successfully, without taking too much risk ... or click here to learn how to create wealth through real estate investing ... or click here to investigate a new online shopping business that can generate thousands of dollars in extra income for you every month. Take action!! That is the key ... and it's the main message in this review of the December edition of The BeHappy! Newsletter. That’s a very important question. Have you answered it for yourself? If so, what was the answer? If you’re like most people, the answer is “no” ... you could be happier (and really want to be happier). And that doesn’t mean everyone is unhappy, or even miserable (although many people are). It just means you could be happier. If you are like many people, you may not have even taken the time or effort to ask that question of yourself... but you probably know the answer anyway. If you are not as happy as you could be in your life, for the vast majority of people, there are discrete reasons – and, importantly – things that can be done to make you happier. What this means is ... Happiness (“H”) is equal to your level of Gratitude (“G”) ... plus the degree to which you are living consistent with your own personal Definition of Happiness (“DH”) ... plus how much you Contribute to others ("C") ... plus your success in what I call the 3 R’s of happiness (“3R”) ... all divided by 6. This is a “simple” formula which can help you determine how happy you are in your life at any time, and then create a plan to improve it. And while it really is a simple formula, it’s quite detailed in its use and value. So, for the next year (the rest of 2011 and into the beginning of 2012) I am going to focus each edition of this newsletter on one of the 4 main components of the formula (G, DH, C, and 3R). Then, after all four components have been addressed, the following edition of the newsletter (in early December) will be the 2011 “Holiday Happiness” edition, and then the newsletter after the holidays (at the start of 2012) will be directed towards putting everything in the equation together to develop your own Happiness Plan, which will guide you to your happiest possible life! It will be a great way to ... (1) make 2011 a great year, (2) enjoy the 2011 holiday season more than ever before, and (3) start 2012 off with a great plan to take your happiness to the next level – and never look back. So essentially, this edition of The BeHappy! Newsletter kicks off a year-long “happiness process” designed to give you just about everything you need to make the next year a turning point in your life. “Tweak” the necessary components of your life whenever you need to in order to keep you as happy as you can be ... for life! Get your copy of this valuable eBook for only $9.75 by clicking here. This introductory e-book will start you on a process to begin loving what you do in your job or career – or help you change your job or career if that’s what you need to do to be doing what you love. Now, please read on and continue with the "Actions" described below to help you get started on this “year-long” happiness process that, if you really do it, will change your life forever. Like everything in life, the old saying, “practice makes perfect” applies to happiness, too. By using the tools and concepts in BeHappy! - and applying the principles on my website (www.behappy101.com) and in this bi-monthly newsletter - you'll get the coaching and the “practice” you need to lead the happiest possible life. It takes daily action to get “perfect” at it, though. 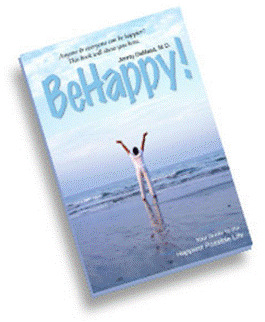 So, if you have read previous editions of The BeHappy! Newsletter you know that every issue provides some simple action-oriented exercises for the next two months (until the next edition of the newsletter) which relate to the main "subject" of this edition of the newsletter to help make happiness a habit. The action plan for the next 60 days is to evaluate your current level of happiness so that you can be totally prepared for the next 6 issues, where we will get specific on each component of the “happiness formula”. This formula will result in a “happiness score” which will range from “1” to “10” (the commonly used “10-point scale”). The closer your score is to “10”, the happier you are. Have you created your own personal Definition of Happiness? Most people haven’t, and if you are one of those people, for now, just write down a “5” for this part. We will get to how you develop that Definition of Happiness in the June edition of this newsletter (the 3rd part of this year-long life-changing process). You can also read a “DH primer” to learn a bit more right now about your Definition of Happiness by clicking here if you want to get a bit more insight. The complete process is also found in the first couple of chapters of BeHappy! (so if you really want to figure out your true Definition of Happiness, click here to get your own copy. Now, if you have created your own Definition of Happiness, use the 1-10 scale to rate how consistent you are living that definition. Here’s what I mean ... If, for example, your definition of happiness includes a certain level of financial abundance, the need for a particular type of intimate relationship, and a specific job or career, and you are not at that financial level, don’t have that relationship, and/or aren’t in that job or career, then you may be between a level “2” and “6”. If, however, with that same Definition of Happiness, you have achieved a certain level of wealth, are in a great, fulfilling relationship, and have a job you love, then you might be somewhere between a “7” and a “10”. There’s much, much more to this whole Definition of Happiness issue, so if you are like most people, you really need to either wait for the June edition or get a copy of BeHappy! now to understand it better. For now, though, write down your best "guess" as to what number from 1-10 you are living consistent with "what happiness means to you". Make sure to write down the number. Finally, the level of regret you feel in your life must be rated. Regrets, especially major regrets, can destroy or at least reduce your level of happiness. And this can be regret for things you have done (like stealing, doing drugs, or cheating on your spouse) or regret for things you haven’t done (like not going to college, not pursing your passion as a career, or never having children). Here, again, the higher the score, the fewer regrets you have in your life. At the extreme, if you have “no regrets” in your life, you would give yourself a “10”; but if you have many regrets – and it’s “eating” at you, then you might give yourself a “1”, “2”, or “3”. At this point, if you have done everything so far, you should have 6 numbers between 1 and 10 written down on a piece of paper. Once you have those 6 numbers, it’s time to calculate your “Happiness Score”. And it’s really quite simple. To get your score, just add up the numbers for each of the 6 components of the process above. You should have a 1-10 score for each of (1) G, for gratitude, (2) DH, for Definition of Happiness, (3) C, for Contribution, (4) R, for Relationships, (5) R, for Rules, and (6) R, for Regrets. Once you have all 6 of these numbers, add them together. The result should be a number between 6 and 60 (unless you used a “0” for any of the components, then it could be less than 6 – but hopefully nobody is in that category). 7 + 5 + 8+ 6+ 3 + 6 = 35, which when divided by 6 = 5.83. If this was your score, I would bet you are not very happy in your life. Also, even if your score came out to an "8.83", which is not bad, maybe you still want to be happier. So calculate your own "Happiness Score". This is the first step in a year-long journey toward your happiest possible life. Use this score to take the next 60 days to start thinking of ways to improve in each of these areas. And if you want to take this a step further, you can sign up for one-on-one personal E-Coaching by clicking here and I’ll help you personally with all this. I provide a free introductory session as part of my BeHappy101.com package. We’ll look back on this 60-day action plan in the next edition of The BeHappy! Newsletter around mid-April - where we'll then take the next step toward making profound improvements in your happiness – and your life. Every issue of this newsletter will keep you up to date on new stuff at BeHappy101.com so you can get maximum benefit from the BeHappy! system. You can access any of these quickly by just clicking on the links in the list below. Several new "Happiness Products" have been added to the website. There are products for making more money, improving your relationships, reducing stress, raising happier children, learning to meditate, losing weight, and more. The opportunity to join the new Happiness Group". Just click here to see a 11/2 minute video introduction to the group. Then, go to facebook and search "The Happiness Group" to join. Several important new blog posts to add to your "happiness toolbox". The popular Thought for Today: a feature on the site initiated February 1st (2009) which has provided a new thought every single day since then. Each new Thought for Today gets posted on the behappy101.com homepage every morning (365 days a year) between 5:00 a.m. and 6:00 a.m. (unless I sleep in – then it might be 6:30 a.m.). These are thoughts to help start your day off right. The thoughts are generally about happiness, success, relationships, money, etc. So go to the website everyday for a new “thought”. You’ll soon become “addicted” – and it will improve your life tremendously. New Quotes, Poems, and Jokes to help inspire and motivate you, or just make you laugh. Also, be on the lookout in the next few months for an amazing new company I have started with two other great "happiness guys", Rudy Wietfeldt and Steven Diamond. Check out the initial website at Be-Happy-For-Life.com.